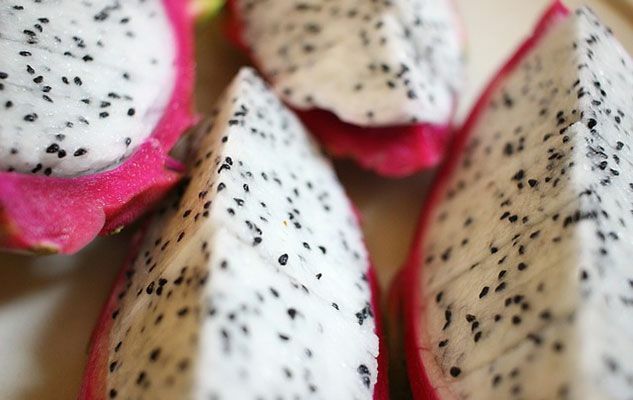 Whether we call it pitaya or dragon fruit, a reptilian resemblance can certainly be found to this pink or yellow skinned fruit that is becoming increasingly available even in the supermarket. However its scaly skin should not put us off because it hides a tender and juicy flesh with small black seeds and a kiwi-like texture. The taste is mild and better when the fruit is cold. Native to Central America, this fruit comes from a species of cactus called hylocereus. Its nickname, dragon fruit, is actually a translation of the term used in several Southeast Asian languages to describe this fruit; it also probably refers to the plant that produces it, a plant that winds itself around tree trunks and whose intertwining resembles the sinuous shape of a dragon’s body. The same fruit is known in America by the name of “Pitahaya” or “Pitaya”. You should choose a bright coloured ripe fruit without spots, which feels slightly soft when pressed. Cut it lenghtwise with a sharp knife and scoop out the flesh with a spoon. Be careful not to eat the skin, as it is not edible. This fruit can be enjoyed as it is or in salads, sorbets or smoothies. Originally published in the Journal de Montréal on March 29, 2014.